Click on thumbnail to view release stats. Some species may pose a physical or public health threat, such as piranhas and freshwater stingrays. Current Problems Currently, at least 126 different species of exotic fishes have been caught in open waters of the United States, and 46 of these are known to have established breeding populations. 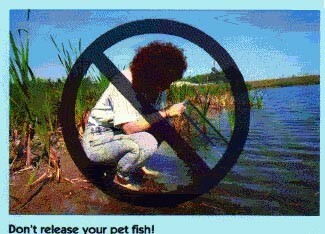 Over half of these introductions are due to the release or escape of aquarium fishes. Because many of these fishes are native to tropical regions of the world, their thermal requirements usually prevent them from surviving in temperate areas. In the U.S., therefore, most introduced fishes have become established in Florida, Texas, and the Southwest. Examples include a number of cichlid, such as the oscar, Jack Dempsey, jewelfish, convict cichlid, Midas cichlid, and spotted tilapia; and livebearers, such as swordtails, platies and mollies, and armored catfishes. The goldfish, a native of China, is one of the few examples of a temperate aquarium species that is established throughout the U.S.
Information was graciously provided by the Nonindigenous Aquatic Species Program and the U.S. Geological Survey. Please click on their logos for much more information.